It comes with great admiration and sorrow that we come together today to celebrate the life of Mrs. Eugenia Strickland-Edgerton. A mother, grandmother, auntie, and friend. Mrs. Edgerton raised 15 of her own children while also opening up her home and raising some of her nieces, nephews and grandkids. Mrs. Edgerton was the daughter of the late Cora and Florence Strickland. A fighter, Mrs. Edgerton was always up for a challenge and worked all the way up to her 90th birthday. Working as a nurse for most of her life, Mrs. Edgerton was a jack of all trades and could not only cook the best pineapple upside down cake you ever tasted, she could also clean like nobodies business, and was a terrific advice giver! Mrs. Edgerton will be deeply missed and was a notable and respected figure in her community and her church. 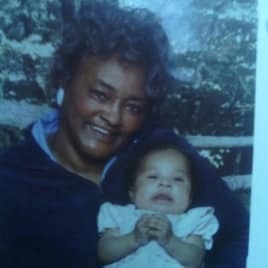 Mrs. Edgerton passed away silently in her sleep Saturday night in her home in Louisburg, North Carolina and was found Sunday morning by her daughter, Patricia Edgerton. She is survived by her children, Dorothy, Waverly, Patricia, Eddie, Mac, Carolyn, Solomon, Clementine, Maurice, Ricky, James, and Steve. Her nieces, Bonnie and Linda, and her 20 grands. and 12 great grands. The service will be held at, Calvary Cross Baptist Church. Healgrief has a memorial to share with you. https://healgrief.org/eugenia-strickland-edgerton/ We invite you to express condolences, share special memories and photos and light virtual candles to honor and celebrate the life of our loved one. We also invite you to share this with others who may want to be notified as well. You may do so by sharing the link or by clicking the “Share this Memorial” button from within the memorial itself.